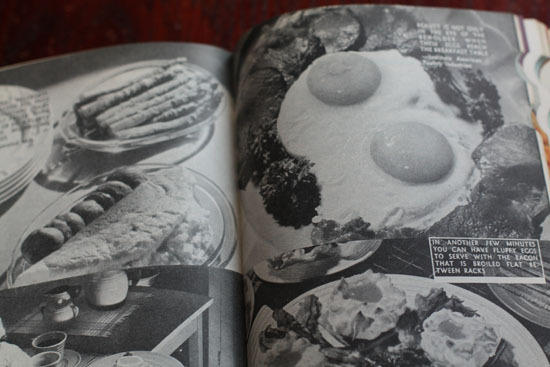 If your curious about what “Wartime Edition” means for a cookbook, you’re not alone. Luckily the very first page gives a hint. 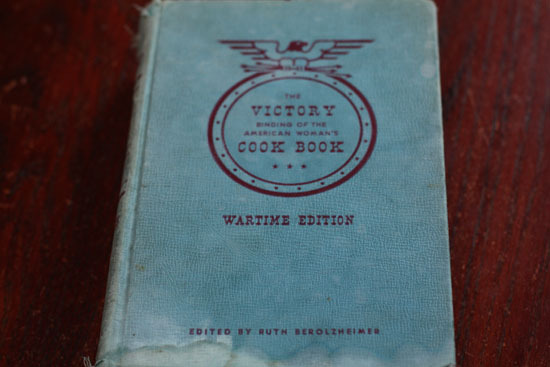 The book is filled with “Victory Substitutes and Economical Recipes for Delicious Wartime Meals.” I don’t know about you, but I love a good victory substitute. Turns out that cooking during wartime was pretty similar to cooking during peace time. This book, however, basically assumes that you have absolutely no cooking knowledge at all. If you think about it, this is vastly different from cookbooks today. I don’t think I’ve ever opened a cookbook before and saw a definition for boiling water. It’s clear that this near thousand page tome was written with the purpose of being the only book a cook would need to succeed. Luxurious photos! No seriously these are good for that day. Being a Victorious Shopper and Eater! I’m not kidding when I say that if everyone read and followed the section in this book called “How to Buy Food” we would most likely all be healthier, skinnier, and happier. It’s amazing to me that people had such a solid idea of how to eat healthily sixty years ago and now it seems to be such a struggle. It makes eating sounds so simple. It’s such a huge difference (and improvement in my opinion) from the barrage of dietary advise we get these days. It reminds me a lot of the very simple advise in Michael Pollan’s In Defense of Food. These sections are just part of the first 100 pages of the book which basically could act as a very condensed culinary school. Now, I’ve never been to culinary school so I can’t say that definitively, but let’s just say that these pages are packed full of information. If you think about it, it makes sense. I’m sure printing was not cheap back then and so it was important to pack in as much as possible on each page. Again, this is just so different from the cookbooks of today which have about a recipe per page and 20 point font. I was really hoping that there would be some really obvious substitutions in this book for “wartime victory substitutions”, but I wasn’t able to really find any. Granted I didn’t read all 1000 pages of the book, but I spend a good afternoon carefully thumbing through it. The only real trend I noticed is that the book mentions more than once that meat doesn’t have to be the star of the show. That could be maybe because meat was in short supply or maybe because they were smarter back then than we are today. I was hoping to see some crazy substitions like a meatloaf with mushrooms instead of beef (awesome idea), but no. The meat loaf still has meat. In fact all of the meat dishes are meat packed. Well, there are literally hundreds and hundreds of recipes in this book. Maybe close to a thousand. Every page has 3 or 4 recipes on it. That is amazing to think about. But, in general, leafing through this book just gave me a distinct reminder of how lucky most Americans are today. Our problem is that we literally have too much food. And one could even make the argument that some of it is too cheap. Food preservation, menu planning, and shopping know-how was obviously very important sixty years ago because there are so many pages allotted to those subjects. Unfortunately those skills have kind of fallen by the wayside today. So if anything this book really made me pause and think about some of the habits I have with food and how utterly different they must be from what people did sixty years ago. The back cover might cause seizures. I’ve reviewed old cookbooks before here and I must say that I really love them. I’m thinking that collecting these old books could be something I would really enjoy. Beautiful. I just love old cookbooks and recently happened upon an estate sale where I got several for a quarter each. I've read through them thinking much of the same things that you have – we have too much now, things are too easy, we no longer need to exert much effort to feed ourselves and, then, in a way, our food is no longer packed with the meaning that it once was. Any idea where to find a copy of this book?? Great review. I love old cookbooks and have a number of them from the 1800s. It's funny how cookbooks from different eras make certain assumptions. In the book you reviewed you say it treats the reader like they know nothing and it explains everything. Well, it is just the opposite for cookbooks from the 1800s. It is assumed that the person (woman) reading it was already very familiar with cooking so instructions are very sparse in detail, if there at all. I have seen numerous recipes in these books that are nothing more than a listing of ingredients and it is assumed that the person cooking would know what to do with it. 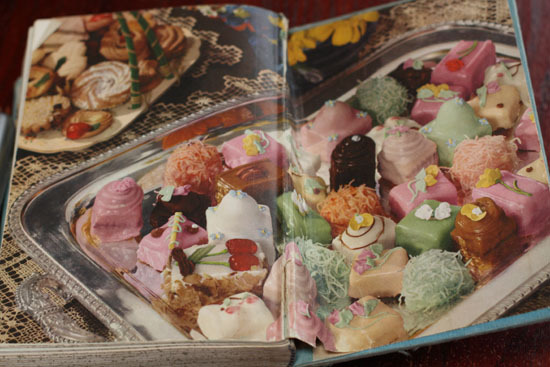 I love old cookbooks too! Nice review. Meat was rationed during World War II, Hence more stress on meatless meals. @Taney Nah. I'm not really sure where you could find it. Maybe check eBay? Young Americans today now could not imagine living during a (modern) time when food is rationed and you were given coupon books for allotments of eggs, milk, sugar, etc. Even during this time of war for America, that is an unfathomable idea. 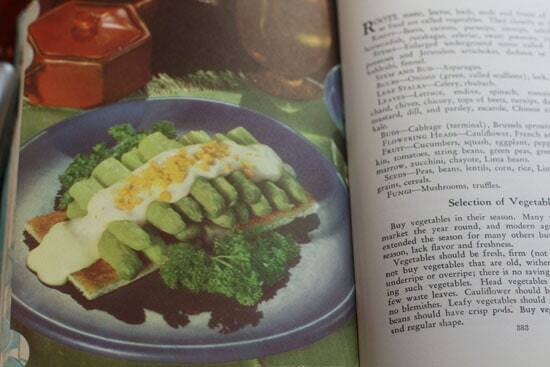 My Mother had this cookbook. It was the only cookbook I remember as I was growing up. I loved to read it and look at the pictures. My Mother gave the book to me when she was older and had plenty of newer books.I now keep it in the cedar chest. I also own this book. It is a treasure of information. It belonged to my mother. Also have one from my Grandmother. My Daughter would love to have it, but everytime I start to read it memories flood back. Some day I will have to hand it over to her.